"I studied Public Relations," she says, "and although the course focused more on political PR, I was more interested in PR's cultural elements, and I based my dissertation on the role of fiction in creating a PR specialist's image." After graduating, Valeriya worked as an account manager in a language school, where her duties included public relations activities. "It was interesting to work with people from different backgrounds learning new languages," she says, "and as my first degree was in PR, the job was a good match for me." Valeriya knew that she wanted to take her studies further, but was not entirely sure what direction to take. She was interested in the cultural element of the creative media, so she began looking for suitable courses. She concentrated her search on London, as she was very keen to live and study there. "For me, living in London was important, as the city itself is a vital part of studying the creative industries," she says. "Being in such a culturally rich environment would also help me to find interesting internships – London is a very exciting place to learn from practical experience." When Valeriya found the MA Creative Media Industries at LSBU, she knew it would be the right choice for her. "It embraces all sectors of the industry and gives me the chance to explore them, which was just what I was looking for," she says. To help fund her studies, Valeriya applied for a Vice-Chancellor's Scholarship in the Merit category, open to students who achieved a 2:1 in their undergraduate degree. "I was honoured and extremely happy to be chosen as a recipient of the scholarship," she says of the moment she found out she had been successful. "The fact that my work was being recognised in this way was really important to me," Valeriya continues. "Of course, the financial support also means a lot. Without the Vice-Chancellor's Scholarship, I would have worried about the cost of living and studying in London, but now I can devote all my attention to my studies. I can be a little more selective about any part-time work I take on, so I am able to look for work relevant to my studies rather than taking on something just to pay the bills." 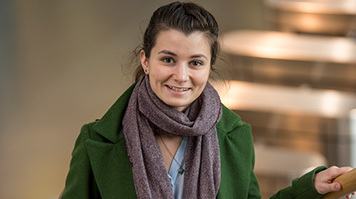 Valeriya is determined to make the most of the opportunity that she has at LSBU. She is keen to repay the faith that has been shown in her not only by LSBU, but by her mother and her friends, who encouraged and empowered her to continue her education abroad. "My scholarship is amazing, and I thank LSBU for it," she says. "It's a powerful extra motivation to make the most from my course, and the chance I have to study at LSBU."